The World Council of Churches 9th Assembly came to an official end Thursday with closing prayers. 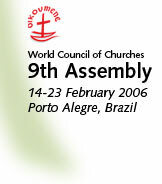 Former general secretaries of the WCC gathered for a ceremony commemorating the Assembly at its Porto Alegre venue. Delegates and others paused Wednesday afternoon to say thank you to the 150-plus young adult stewards who have assisted the operations of the Assembly over the past two weeks. Tuesday's "bate-papo" chat featured New Zealander Michael Wallace, general secretary of the World Student Christian Federation, and Bishop Barbel Wartenberg-Potter, chair of Bread for the World and wife of former WCC general secretary Philip Potter. Need an ecumenically themed book? Want to pick up a water bottle? Looking for a WCC-emblazoned souvenir from the Assembly to take back home? The WCC bookstore at the 9th Assembly has been able to satisfy all these requests and more. Dance and theater groups daily give demonstrations of the cultures of their towns and regions, along with presentations of the mission and witness of the churches and organizations from which they come. Participants in the 9th Assembly scattered across Porto Alegre for worship with local congregations Sunday morning. An activist from India, Angelious Michael, called for the boycott of Coca-Cola products because a lot of water from the community is diverted to their factory while their waste products pollute the environment. Most Rev. Dr Rowan Williams, Archbishop of Canterbury, was the guest in Friday's "bate-papo" chat, paired with Peggy Mekel of Indonesia.